Demographic shifts in the U.S. as well as globally have made aging an issue of high interest, yet little is known about the realities of Muslim experiences. To this end, ISPU Scholar Kristine Ajrouch, using a multi-method approach, including focus group discussions with older adults (60+), one-on-one interviews with community leaders in the metro-Detroit area, and a web-based survey, sought to provide critical preliminary information concerning aging families. Whether U.S. or foreign-born, survey respondents report similar levels of need. Arab/Middle Eastern Americans report not only higher proportions of need and receiving help in most areas, but also high levels of satisfaction with received help. African Americans report lower levels of need and help received, but are most likely to report lowest satisfaction with help they receive. Elders discuss the importance of meaningful social relations both with the younger generation and with same-age peers. Strengths include the elevation of elders in scripture and community tradition. Community leaders emphasized advantages from integrating older adults into general community activities. 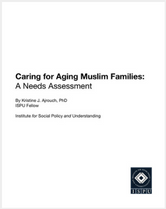 Top challenges that American Muslim communities face in addressing needs related to aging include generational conflict, perceived discrimination, prioritizing issues related to aging, the ability to talk openly about aging issues, and locating funding to design initiatives. Future planning directions include a desire for Muslims to care for their own. Elders caution that proceeding with small steps is important to ensure success. Community leaders emphasize the importance of moving beyond the mosque as an effective means of achieving acceptable and effective care options.